Husband’s Lancaster Bomber Model Project! My husband loves to make model airplanes (which I think is really cute, seeing a huge 6 foot 4 inches guy putting together these tiny parts). 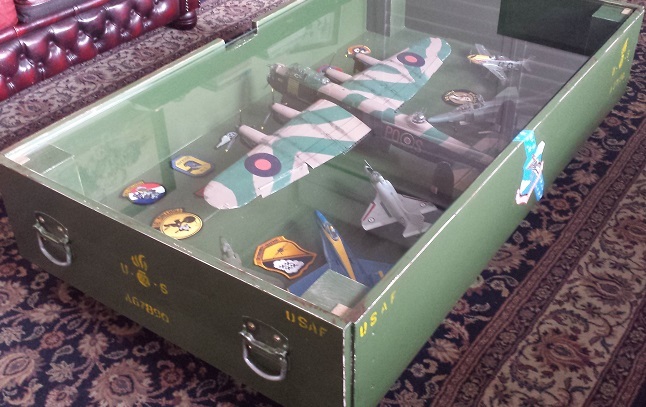 Given that we had nowhere to display his plethora of planes he decided to make a display coffee table that he could put his planes in. I couldn’t believe it….he had never made a piece of furniture in his life. He’s not the handy-man type of guy to say the least (and I’m ok with that) so I was really impressed that he did his research and made this display coffee table completely by himself. He even painted it as well, applied some stencils and put the box on wheels so its easy to move around. The Lancaster Bomber is the latest and largest model that he has built. This one took him 2 years to complete. It was a mail order subscription of 125 issues and is made from aluminium, steel and wooden parts. Brian tells me that it is made to the same specification as the real Lancaster Bomber. He also painted the bomber. Dale my brother took the photo below. 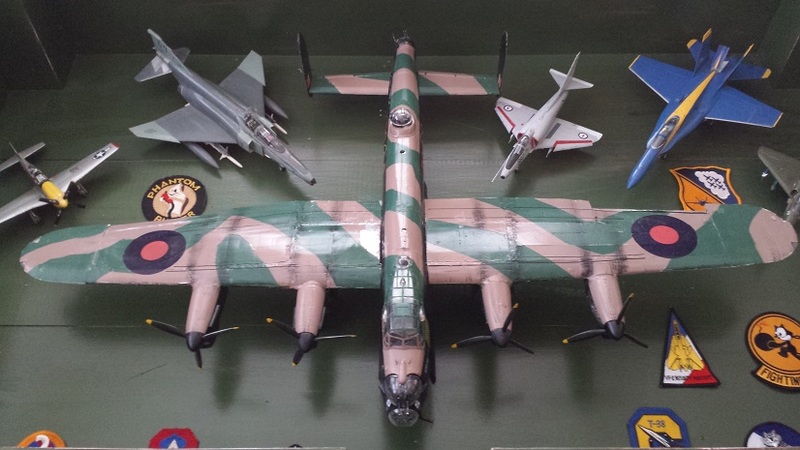 This entry was posted in Family, Lifestyle, Photography, Upcycling and tagged Lancaster Bomber RAF, Model Aircraft. Bookmark the permalink. ← My Coil and Slab Pots – at last some Professional Photos! impressive. Thumbs Up for your husband. hi there. Yeah, I have to keep him busy some how. He continually surprises me. I wonder why he can’t have the same attention to detail when he washes the dishes though….quite baffling. Very nice case/table! The models look great, too. Cool. Glad you like them. I’ll pass on the compliments to hubby. I love it!!! That is amazing my husband also builds war bird airplane models. That is a deal we have when we travel I can go to any clay shop I want as long as I am willing to go to any airport museum or model shop with him. It is a win win situation for me. I always spend more than he does. That’s funny cause we do that to. Good way to keep the marriage happy I say.